I like to write about my life. My mom inspires me, working with people and writing. Junie B. Jones books are my favorite. Recess is my favorite time of school. My head is where I get my ideas. I walk to the mountain. I hike up the mountain and see big, large rocks floating in space. Then I float around and I go look at stuff like the rocks. I see the yellow dark stars and the sky is dark like a galaxy with black. I throw my grappling hook onto the mountain, and I climb up. It’s kind of cold. On the floor I see blue shaded ground with little holes. When I went up there, I just wanted to see the sky. I see stars in the sky. I am alone on the mountain, and I just look up at the sky and eat a PB&J sandwich. I also drink apple juice with it, but I only get to eat half of my sandwich when I see a huge rock crashing down from the big mountain. 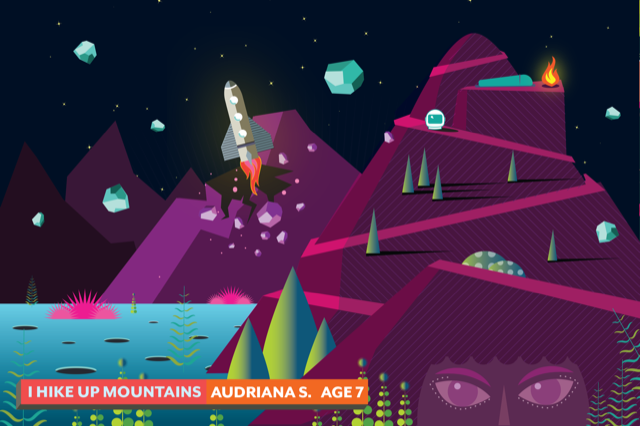 A big rocket is trying to land on the mountain, which makes the mountain crumble down. No one comes out of the mountain so I make a fire with rocks. I put both of the rocks on the side of me in my sleeping bag and go to sleep. When I wake up in the morning, I walk back home. I brought a helmet to space with me and I go home with a big rocket and it’s a galaxy rocket with little holes and that is how my mountain ends.